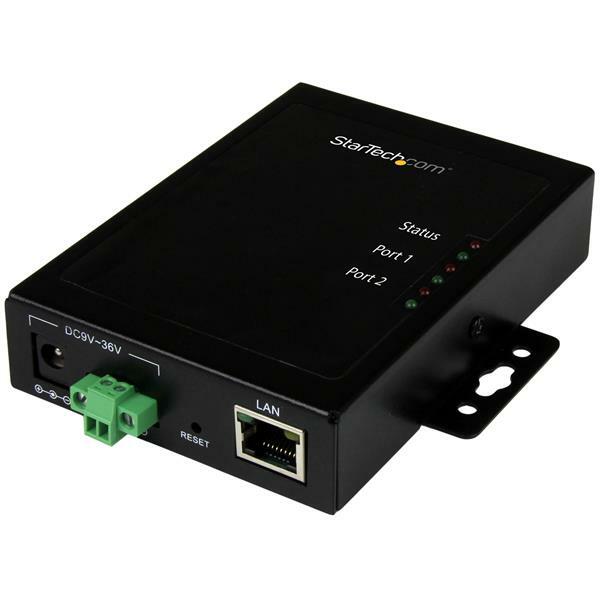 This 2-port serial device server is a cost-effective way to remotely connect to and manage two serial devices over your typical IP network. 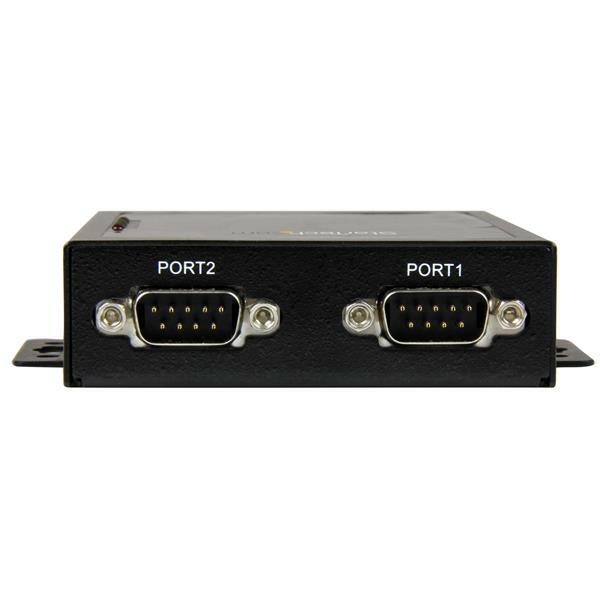 The device server integrates two RS232 ports into a rugged metal housing with an extended operating temperature range, so it’s perfect for factory and industrial settings. 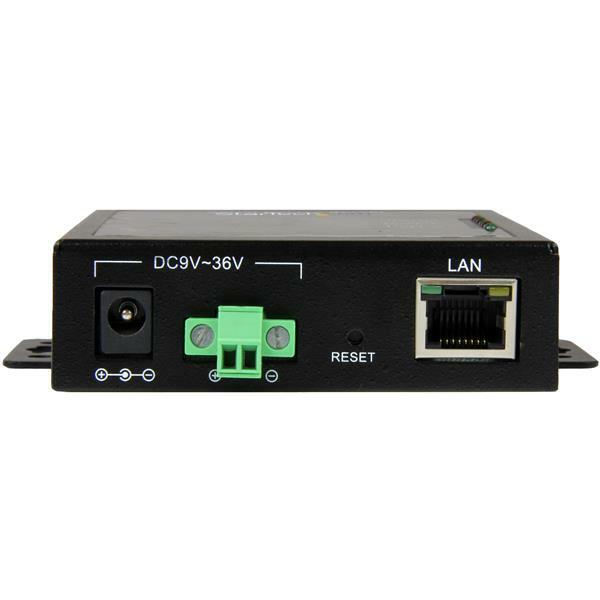 If you’re looking for a reliable serial-over-IP control solution, then this device server can help. With a rugged metal housing and an extended operating temperature range, you can rest assured that the device server can deliver the reliable performance you need, even in harsh environments. Plus, it features two integrated mounting brackets, so you can mount the device server to a surface or a wall as needed, for out-of-the-way installations. With redundant power input, this dual-port serial device server ensures seamless operation, even in the event of power dips or failures. It features a wide-range, terminal block power input (9~36V DC), and includes a universal power adapter. Because it features two power inputs, if you experience a power disruption the device server automatically switches to its secondary power source. With redundant power input, the device server remains operational if one of the power sources fails, so you can continue to connect to and manage your serial devices when needed. This highly customizable device server is easy to configure to suit your application. For easy setup, Windows® users can use the provided Virtual COM port software, or the versatile Web-based interface. The RS232 device server supports Telnet (an operating system independent communication protocol), so it can be integrated into mixed OS environments (Windows, Mac, Linux®). Plus, it supports VCOM, TCP, ICMP, IP, TCP, UDP, DHCP, and BOOTP protocols. 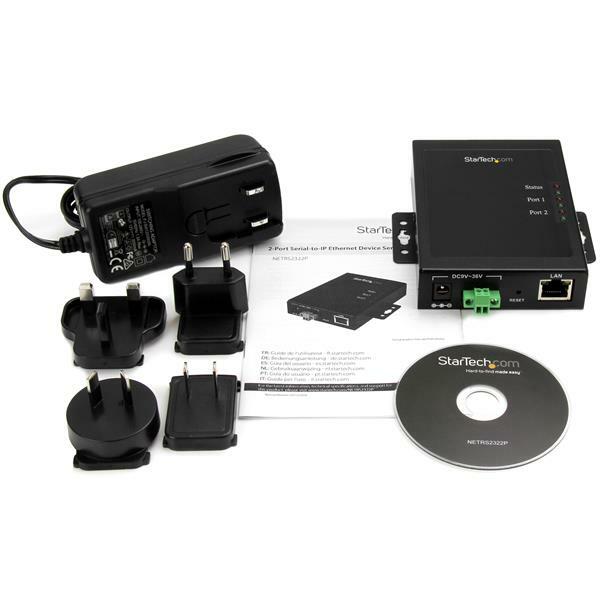 The NETRS2322P is backed by a StarTech.com 2-year warranty and free lifetime technical support. Note: The device server’s hardware is compatible with Mac OS and Linux®; however, the provided Virtual COM software is not compatible with these operating systems. When used with a Mac or Linux operating system, the device server can only be configured using the Web-GUI. How do I setup my network serial device in Windows? Before you continue, make sure that your computer can communicate with the network serial device over your network. For more information, refer to the following FAQ. Download the latest drivers from the StarTech.com website (http://www.startech.com/Support) and enter NETRS2322P in the Search by Product Number box. In the list of extracted files, select the folder for your operating system, and open the 32-bit or the 64-bit folder, depending on your system type. Right-click the EMTDST-[x].exe file and select Run as Administrator. Open EMT VSP Manager from the Start Menu. Double-click on the server in the list. Note: If you have multiple servers in the list, you may use the Buzz! button to identify the unit. The unit that has been buzzed will blink the top red LED on the unit. Set the VSP name to your desired COM number (e.g. COM1). Beside MAC-address is the port number. Port 1 on the NETRS2322P is 1001, Port 2: 1002. Press OK to add the COM port to Windows. (Optional) Repeat steps 1-7 for the remaining COM port on the unit. How do I access the web interface of my network serial device? Make sure that the computer is on the same network as the NETRS2322P. In an Internet browser, enter the IP address of the unit. The default IP address is 192.168.1.40. This device's default static IP address is 192.168.1.40. Disconnect any power sources from the device server. Open the device server’s housing by removing the two screws from the device server (one screw is on each side of the device server). Press and hold the Reset button until the device server beeps twice. Note: The Reset button on the outside of the device server is a hardware reset that reboots the device server.